Starting today, users in some international countries which include Venezuela, India, Indonesia, Australia, and South Africa are able to use Facebook Messenger without even having a Facebook account. 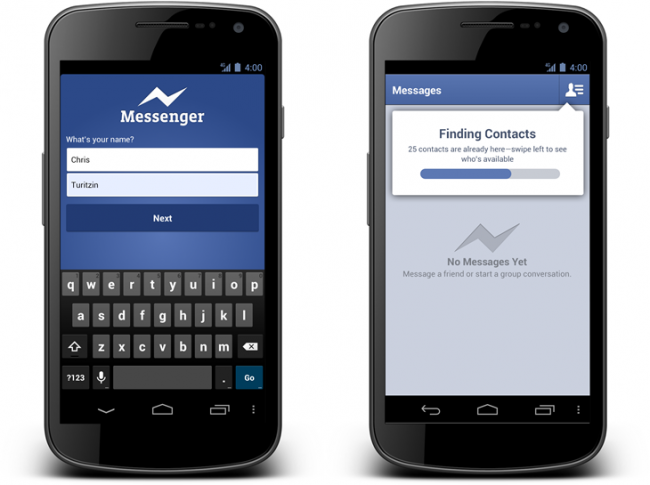 Once the Messenger app is installed on their device, all they need is their name and a phone number. After providing the necessary info, the application scans for available contacts (kind of like Kik), then you’re free to group message, share photos, and more. No word from Facebook yet on if we can expect this same update here in the U.S., but it was mentioned that it would be rolling out to additional countries in the following weeks. If you wouldn’t need an actual Facebook account to use their Messenger service, would you feel more inclined to use it? I’m sure plenty of younger folks would indeed.